It’s not always easy finding something that’s crunchy and satisfying when it comes to keto recipes, in fact most of the things I eat have no crunch at all. Sometimes those crunch cravings hit me hard at night, when I just get home and want a fast and easy snack. 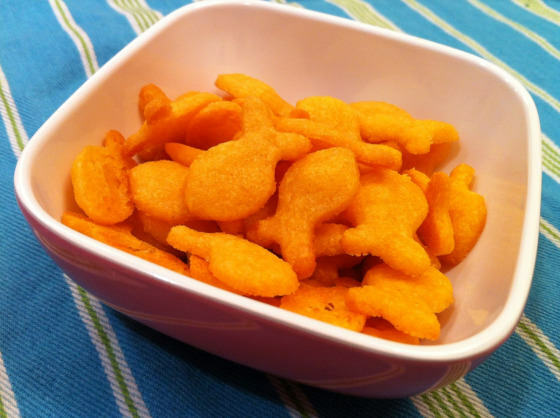 I found this goldfish cracker recipe online and modified it to use coconut flour to minimize the carbs. They’re freaking delicious – crispy, crunchy, cheesy, the holy trinity. Best of all this keto snack only takes about 10 minutes to prep and cook, but there is some wait in between. It’s super simple, really delicious, and I can guarantee that it will cut those temptations of potato chips away for good! 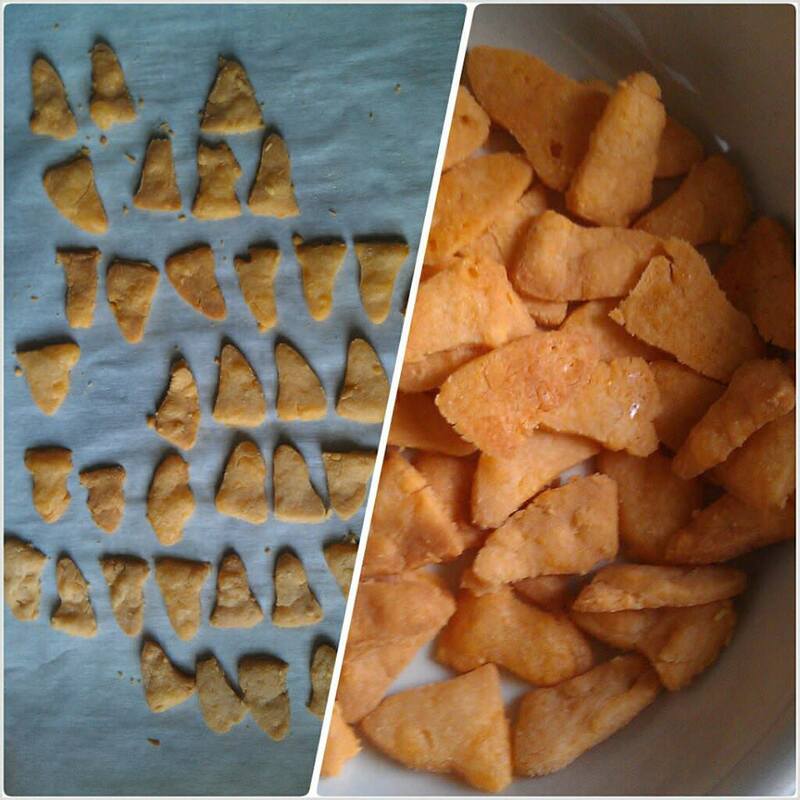 You can find cookie cutters in the shape of goldfish online and in some kitchen stores, but I decided to go easy and cut them into triangles because they’re just about the same to me. At the end of the day when I put them in my mouth and they satisfy my cravings, that’s all that really matters. This recipe and the photos are courtesy of Mercy W. on reddit/r/ketorecipes. 2. Add the cheese, butter, coconut flour, salt and onion powder into a food processor. 3. Pulse all ingredients until a light dough forms. 4. Wrap the dough in plastic wrap and stick it in the fridge for 30 minutes. If you’re really in need of them, you can put the dough in the freezer for 10 minutes (consistency turns out a little less crunchy). 5. Place dough between 2 sheets of parchment paper. 6. Roll dough to about 1/8″ thickness. 7. Cut the dough into triangles, or use a cookie cutter if you have one. 8. Spread the chips onto your parchment paper evenly. 9. Bake for 4-5 minutes, or until the edges are starting to to turn light brown. 10. Let sit for 3-4 minutes, and enjoy! This makes 1 recipe of Better Than Goldfish. Each serving comes out to be 243 Calories, 22.46g Fats, 2.01g Net Carbs, and 7.62g Protein. Add the cheese, butter, coconut flour, salt and onion powder into a food processor. Pulse all ingredients until a light dough forms. Wrap the dough in plastic wrap and stick it in the fridge for 30 minutes. If you're really in need of them, you can put the dough in the freezer for 10 minutes (consistency turns out a little less crunchy). Roll dough to about 1/8" thickness. Cut the dough into triangles, or use a cookie cutter if you have one. Spread the chips onto your parchment paper evenly. Bake for 4-5 minutes, or until the edges are starting to to turn light brown. Let sit for 3-4 minutes, and enjoy!